The space shuttle Atlantis has undocked from the International Space Station (ISS), after a mission described as one of the most complex in recent years. 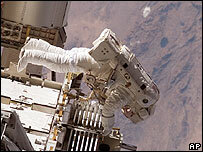 During the 11-day mission, astronauts made three spacewalks, installing solar panels on the space station. The panels - which weigh 17 metric tons and span more than 70m - will eventually supply the station with a quarter of its electrical power. 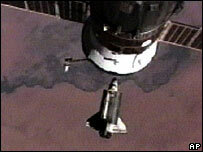 The shuttle is expected to return to Earth on Wednesday. The hatch connecting Atlantis to the ISS was closed and sealed at 1028 GMT after the shuttle astronauts said goodbye to their colleagues. It pulled away from the space station more than two hours later. After undocking, the Atlantis team planned to circle around the station to check its overall condition and beam images back to Earth. 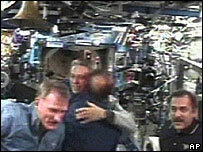 The Atlantis astronauts leave behind the station's current three-member crew, who have been living there since March. The BBC's Corinne Podger says the mission represents a much-needed triumph for the US space agency Nasa. Construction of the station was halted three years ago, after the Columbia shuttle disintegrated during its return to earth, killing seven astronauts. The agency now says it expects construction to be completed in 2010, the same year it plans to retire the ageing shuttle fleet.